Born April 20, 1921, in Reno, NV, Josephine Ruth Clarke became a rodeo queen there and went to Hollywood as a trick rider, eventually signing with Monogram where she was first billed as Reno Blair, then changed to Reno Browne. From ‘46-‘50 she was Monogram’s leading lady in six with Johnny Mack Brown, six with Whip Wilson and one with Jimmy Wakely. Reno died of cancer at 70 on May 15, 1991, in Reno, NV. 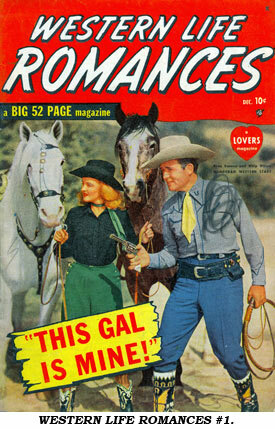 Besides Dale Evans, Reno was honored to be the only other movie cowgirl to have her own comic book. 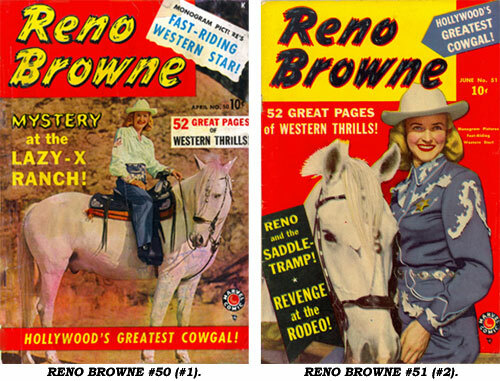 Taking over numbering from the cancelled MARGIE, Marvel issued RENO BROWNE #50 (#1) in April ‘50. 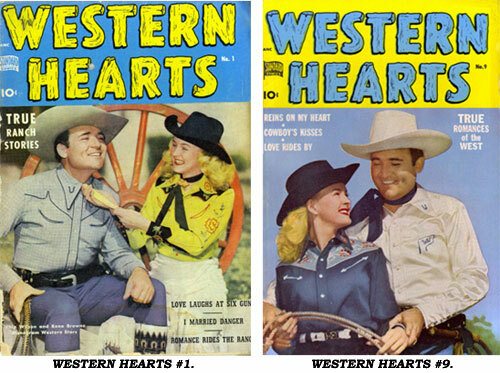 She was photo-cover featured and billed as “Monogram Picture’s Fast Riding Western Star” and “Hollywood’s Greatest Cowgal.” #51 (#2) followed in June ’50 with the final issue, #52 (#3) in September ‘50. Apparently not selling well enough to satisfy Marvel, the comic then became APACHE KID as of #53. 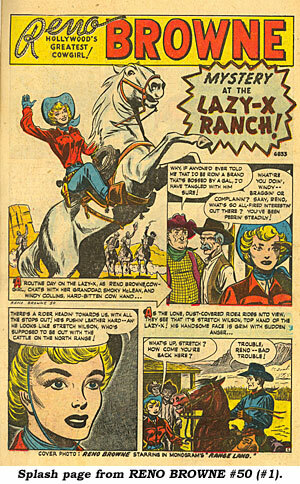 In the stories, all drawn by the excellent Russ Heath (1926- ), Reno was the girl foreman of the Lazy-X Ranch. Her granddad was Smoky McLean with Stretch Wilson as their top hand. Windy and Curly were two comic-relief ranch hands. 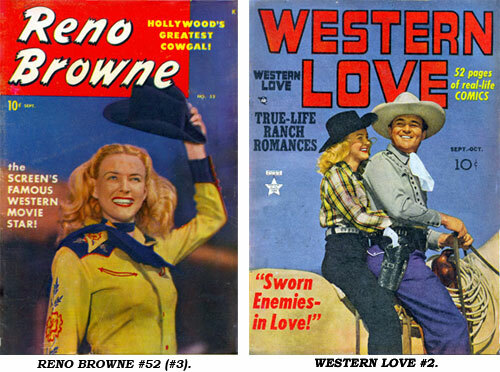 Monogram certainly believed in promoting Reno, earlier she and Whip Wilson were photo-cover featured on Feature Publication’s WESTERN LOVE #2 (9/49); Standard Comic’s WESTERN HEARTS #1 (12/49) and #9 (12/51) and Marvel’s WESTERN LIFE ROMANCES #1 (12/49).